The photograph above shows two cottages. 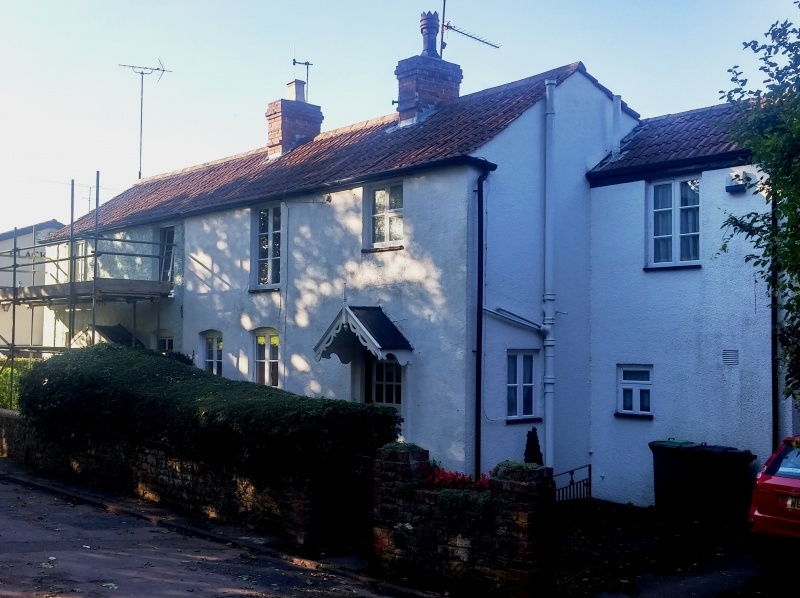 The one to the left with scaffolding is a cottage which has previously been known as Woodbine Cottage and then Bethany before becoming Appledore in the 1970s. It stands next to the Black Horse in Gillingstool and faces the remains of the old road from Thornbury to Crossways and Sibland. This road was later diverted and widened and rises to pass over a culverted stream to join the A38 at Grovesend. The Tithe Apportionment drawn up between 1838 and 1840 indicates that Meshach Benall and his family lived in a property in Gillingstool owned by Thomas Smith. This property later became known as Appledore. Meshach was born in Cam and baptised there on 5th January 1797, the son of John and Joyce Bendall. Meshach married Sarah King in Cam on 7th November 1820 and they lived there for a short while. However an order was made by the Churchwardens and Overseers of the Poor on 19th March 1821 to remove Meshach and Sarah to Thornbury because they had become chargeable to the Parish of Cam. Despite the removal order, Sarah and Meshach seem to have remained in or near Cam as they had two children Elizabeth and George baptised in Cam on September 10th 1823. When another son, William, was baptised on 4th May 1833 the family lived in ‘the Borough’. We are not sure where Meshach lived at the time of the 1851 census. Sarah was living in an unidentified house in ‘Back Street’ (now called Rock Street) with her two sons, George, a mason’s labourer aged 29 and William, an agricultural labourer aged 16. Sarah was either living next door to, or sharing the house with, her daughter Hannah and her husband, George Blake. Meshach died aged 55 on 31st October 1852 in Thornbury. Ann Hollister of Horseshoe Lane was the informant of his death. In the 1861 census George Bendall was living with his mother in 11 Rock Street. Sarah was a widow of an agricultural labourer living with George who was a mason’s labourer aged 40. Both of them came from Cam. They shared their home with Sarah’s grandson, also named George aged 8 from Thornbury. George’s wife, Mary, was living in St Mary Street with Thomas Barge and her three children: Thomas, Samuel and Charlotte Bendall. In 1871 Sarah was still living in 11 Rock Street, now clearly shown as aged 83. Her son George a labourer aged 50 was also still living with her. Sarah died aged 85 and was buried on 26th June 1879 in Thornbury. Her son, George, moved to Bedminster to live with his sister and her family. By the census of 1851 William Pritchard and his family lived in this property. William Pritchard was born about 1804. He married Ann Riddiford on 1st August 1824 in Thornbury. The witnesses to the marriage were Thomas Nelmes and Catherine Pritchard. William was a butcher, according to the parish records at the baptism of his children. We know that they had several children, including George Pritchard who was born about 1828 and Mark born about 1826. However the first child to be recorded in the parish records of St Mary’s Church in Thornbury appears to have been Emma Pritchard who was baptised on 2nd April 1830 at which time her parents were said to be living in Crossways. Annis Pritchard (baptised 4th October 1831) and Thomas Pritchard (baptised 23rd March 1834) were also christened whilst the family lived at Crossways. In 1837 the couple baptised two more children, Jesse on the 25th June and Hannah Priscilla on 6th August. Sadly Hannah died very young and she was buried in Thornbury on 13th February 1848 aged 11. Jeremiah was baptised 21st November 1839. In these records the family was always shown to live in Crossways. The Tithe Apportionment for 1840 shows only one William Pritchard and at that time he was living at a property identified as number 805. This property was at Crossways in what became Crossways Lane. It stood opposite the junction of Clay Lane. The 1841 census shows that William and Ann lived at Crossways and at that time their children were Mark aged about 15, Emma aged 11, Annis aged nine, Thomas aged five, Jesse also aged 5, Hannah aged three and Jeremiah aged 18 months. When Annis Pritchard died at the age of 17 and was buried in Thornbury on 13th February 1848, the family’s address was shown only as Thornbury. When Sarah Ellen Pritchard was baptised in 1845 the record indicated that they lived at Sibland which may indicate that they had moved by that time. William’s wife, Ann died aged 42 and she was buried 14th January 1849. The parish record only gives Thornbury as the address. We do not know exactly when William and his family moved to the property that became known as Appledore. The first record we have of them in this house is the census of 1851. Later that year, on 11th August 1851, William had three of his children baptised on the same day. These were Jeremiah Pritchard, Elizabeth Pritchard and Sarah Ellen Pritchard. By 1861 the widowed William Pritchard aged 52 was again living at Crossways with his three year old granddaughter Hannah. In the neighbouring property was William’s eldest son George who was also a butcher. William may have been buried in Thornbury on 27th January 1862. His son Jeremiah was buried on 12th June the same year. the 1861 census also shows that William’s son Thomas was now living in The Dingle, next door to his father’s former home at Appledore. The 1861 census shows that George Mills lived in this property. George was a mason aged 29 and his wife Martha’s age is unclear but may have been 38 years. They had four daughters Amelia aged eight, Elizabeth aged seven, Anna aged four and Georgina aged two. In the census of 1871 they continued to live at the same property. This time George was shown to be 45 years old and Martha aged 51. George was born about 1831 and his parents were Michael and Amelia Mills who lived in Gillingstool in the Tithe Apportionment and in the censuses to at least 1851. From a family tree on the internet we understand that he married Martha Pearce, the daughter of John Pearce and his wife Elizabeth (nee England). By 1885 the family had moved to what was to become 7 Silver Street. George Mills died in 1891 and was buried on 31st January 1891. His wife was buried 23 June 1900. The 1881 Census shows that the property was occupied by John Strong aged 29 with his wife Ellen aged 27 and their two children William aged 3 and Edger aged 1. A stone mason called Thomas Mills Walker who was a widower aged 56 was living with the family and described as “father” but we believe this was actually Ellen’s father . John Strong was born in 1852 in Crossways and baptised at St Mary’s Church on 7th March 1852. He was the son of Thomas and Jane Strong. John married Ellen Walker in Bristol on 9th August 1875. John Strong’s son William was born in 1878 whilst his parents lived at Crossways. Edgar was born in 1880 and baptised 7th March 1880 (again at Crossways). Another son, Thomas Strong, was born in 1883 after the family had moved to Gillingstool and he was baptised on 2nd July 1882. By 1885 the address of the family was again given as Crossways when Ernest Strong was baptised. John James Strong was baptised 2nd October 1887 with the address of Crossways. Edward Louis Strong was baptised 6th April 1890. By the census of 1891 the family lived at Eastland Hill Lane next door to a widowed Ellen Walker on one side and Walter and Sophia Walker on the other. Ellen Strong died in Crossways and was buried on 25th June 1891 aged 38 years. We note that a young man named John Strong was charged with using obscene language in St Mary Street in June 1915. Could this have been John James Strong? Edward Louis Strong died in Toronto 16th September 1929. The census of 1891 shows that the house was occupied by a charwoman, Hannah West a 76 year old widow. She was the widow of John West. We have a John and Hannah West living in Milbury Heath in 1871 with their son John West Bartlett aged 24 and his wife Harriett West Bartlett. This family appear to have moved from Milbury Heath to Sibland Road by the census of 1881. It seems that Hannah was the second wife of John West who was first married to Elizabeth Swain in Painswick on December 25th 1823. Hannah died in Thornbury aged 76 in the June quarter of 1896. On 31st October 1972 Leonard George Taylor as the representative of Mrs. Margaret Taylor conveyed the property to David Slocombe. Dave had moved to Thornbury with his wife, Liz, when he joined the Rural District Council as foreman of the housing maintenance staff. He went on to become Superintendent of all the Council’s direct labour force. The Slocombes changed the name of the house to Appledore to reflect their family’s association with that village in Devon.